For other places with the same name, see Surat (disambiguation). Surat Thani (สุราษฎร์ธานี) is a city on the Central Gulf Coast of Southern Thailand. At approximately 125,000 residents, it is the eighth largest city in Thailand. 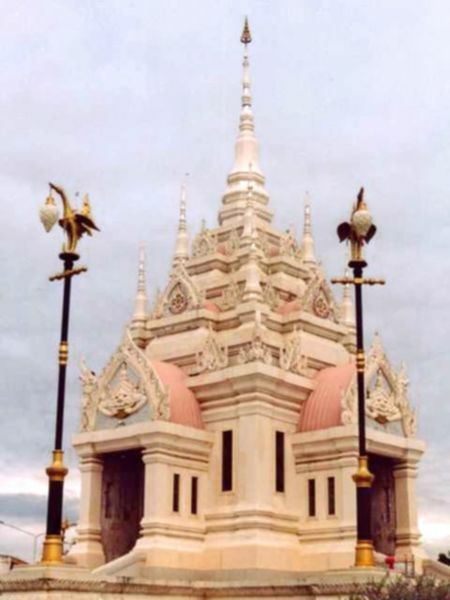 It is also the capital of Surat Thani Province. Surat Thani (often shortened to Surat) is the largest province of south Thailand. Surat Thani means "City of Good People", the title given to the city by King Vajiravudh (Rama VI). It's a gateway to the islands of Thailand's Gulf Coast: Ko Samui, Ko Pha Ngan and Ko Tao. They are much-visited destinations, as well as Ang Thong National Marine Park. Otherwise there is not especially much to do or see in Surat Thani, which means there are not many international travellers, which means it is a great opportunity to see a more real Thailand with local foods, prices, chaos and friendliness. From Bangkok is it possible to buy a train and bus combined ticket from Bangkok to other destinations (Ko Phi Phi, Krabi, Phuket....) to avoid scams in Surat Thani. As soon as you get off the train in Surat Thani they will point you to the right bus (price included) to the city and from there change buses to your final destination. The price from Surat Thani to Krabi is 250Baht (dec 2014) added to the train ticket. Surat Thani Airport (IATA: URT) is about 20km west of the city in the Phun Phin District. Thai Airways, Air Asia, and Nok Air operate daily flights to and from Don Mueang International and Suvarnabhumi Airports in Bangkok. There are also direct flights to Chiang Mai and Kuala Lumpur on Air Asia. Phantip Travel ☎ +66 77 272230, +66 77 282331 on Taladmai Rd has a bus service connecting with all flights to the airport from Surat Thani. The price one-way is 100 baht. Also Pha Ngan Tour will get you to the airport for 100 baht. The buses leave from outside the agent on Taladmai Road, next to Soi 27 and some 200 metres from Soi 31. Buses arrive at the agent from the islands at 09.00 11.00 14.00 17.00 21.00. A bus to the airport is available for the first four, and takes about one hour. The agent is open from 05.00 to 21.00. If you want to go quickly to the airport, a tuktuk should charge about THB400, which is reasonable for a foreigner considering the distance. But you can try to bargain it down, or try another tuktuk. Nok Air  Flights to/from Bangkok (Don Mueang Airport). Thai Lion Air  Flights to/from Bangkok (Don Mueang Airport). Thai Smile  Flights to/from Bangkok (Suvarnabhumi Airport). The Surat Thani train station, despite its name, is located in Phun Phin (พุนพิน), about 15 km west of town centre. Most comfortable are the overnight trains from Bangkok, which arrive in early morning. There are regular orange non aircon buses to the left as you walk out of the station. these take you to to Bus Station Number One in Taladmai Rd (see below). Cost is B15 for the trip. A taxi to the city center from the train station (Tapee hotel used as reference - advertised on big blue poster where taxi drives sleep) is 160baht, however on exiting the station most touts will try to push the same taxi for 300baht. If you arrive from Koh Samui or Phangan on one of the later ferries (240 baht combined ferry and bus ticket to Surat Thani town center) in order to catch a train to Bangkok (they start about 9pm) or Hatyai/Butterworth then the ferry company buses (both SeaTran and Raja ferry buses) will terminate in the city center (usually outside a travel agent), from there you need to negotiate a songthaew ride to the station, from repeated experience this is about 180-200 baht per songthaew, but your bargaining power will be initially in the hands of the travel shop when you disembark the bus so don't be surprised to be initially offered a per person price that can result in the songthaew effectively costing 400thb and up. In these scenarios walk away (or if on the seatran bus stay on another 0.5km until it terminates at the main seatran sales office - not the travel agent) then you can find a lone songthaew and acquire the correct price. Even though the private Songthaew is usually 200thb per songthaew, do agree the price per person, i.e. 200 divide by however many in your group to avoid any "confusion" on arrival. If already in possession of your train ticket (always a good idea to book ahead) and you have some time (e.g. a 1am train etc.) then head towards to the night market (where the slow boats to Samui/KPG go from - lat 9.143838, long 99.322768 - google map the cordinates) and enjoy a few outdoor beers + music and food, there is very little to do in Phun Phin except watching backpackers get increasingly angry due to delays and lack of facilities. You need safely at least about 20 minutes from Surat Thani centre to train station, depending on your mode of transport. The new Surat Thani (long distance) bus terminal is located a bit outside the city (about 5 km); however if you plan to go directly into the city, it is usually possible to ask for a stop before. If you are coming from Phuket, it takes about 6 hours to reach Surat Thani. The bus station is actually located close to the four way intersection of the main north/south road, and the road into town in one direction, and to Phuket and the train station in the other. See below in "Get Around" how to get to and from. There may also be tuktuks there. If you are coming in from Phang Nga, a non aircon bus from there is B150 and takes 2.5 hours. It stops at the train station on the way and terminates in Soi 33 in the city. If you come with the company Songserm (fairly priced joint tickets, not too bad normally), be warned: if (e.g. on their pier in Don Sak) you say that you want to go to the city center, they will put you with travelers to Bangkok, Krabi, Hat Yai and drop you at their private hub station some 15 km out of town in the middle of nowhere. After they told you that the bus ends here, your only chance apart from walking is a songthaew for 80 baht, awaiting you with a big grin. You might be better off getting on the bus to Phun Phin and take the public 15 baht bus from there. If you come with the company Seatran from Donsak pier, the bus will stop at Soi 35 in Taladmai Road, just a couple of hundred metres from Soi 31, where is the number two bus station. You can take the ferry from any of the islands nearby, taking about two and a half hours. There is food for purchase on board and movies on some boats as well. From islands such as Ko Samui, Ko Pha Ngan and Ko Tao, a ferry ride takes between 2 and 9 hours depending on whether you take the fast or slow boat. The slow boat from Ko Tao is overnight and features mattresses for sleeping. The skipper is especially friendly. The Seatran ferry at Nathon, Koh Samui leaves almost every hour until 6pm and costs about 240 baht to Surat Thani centre. The ride will generally cost between 200 and 600 baht depending on the season. Be wary of black market tickets as people will try to sell you tickets for over 2,000 baht promising food and DVDs included in the price. Always go to a TAT approved travel agency. Please be careful in this city! Scams appear to be a way of life here, although they seem to have eased at Feb 2018. 1) If coming in by train, especially the overnight ones from BKK which arrive early morning. There may be numbers of touts who try to sell trips to Surat and the islands directly. Usually, the most aggressive are the most expensive. Ignore them,and take the bus into the city as below. 2) If coming in by bus. Especially the long distance buses. It is possible, or even likely, that at some point in the city outskirts, the bus will stop, and some people will board the bus. They will ask foreigners where they are going, and if to the islands,they will strongly insist that you get off the bus at this point to get transportation to the required destination for this. Apparently, their behavior will not be the same as that of the politeness and calmness of Thai people.They may try to unload your luggage from the bus to make you follow them. If you take them up on the offer, you will be taken several Km distant by songteow, which is promised to be free, to a travel agent in the city centre. You will be charged a ridiculous price to Koh Samui, and if you refuse, will then charge an equally ridiculous price for the songteow ride. Do NOT leave the bus at all! 3) The travel agents - many of these are scammers, and will charge two or more times the correct price for travel, whether to the islands or elsewhere. In Soi 31, are several travel agents, and this is where the local minibuses, buses to Krabi, and buses to the islands (may) go from. Until recently, assorted touts greeted stopped buses to try and entice travellers to a particular agent, but this appears to have eased at Feb 2017. About half way along the Soi on the right hand side,is another travel agent who charged a British couple B490 for a ferry to Samui (each). This was Dec 2013. The hotel travel agents appear to be honest if you are staying in the city. They do charge a little extra, but not hugely so. Also, Phantip Travel, on the corner of Taladmai Rd and Soi 10 (where the orange buses come out), is definitely an honest agent. This particular agency has undergone an office remake (at Feb 2018), and they are totally honest in their pricing. They use both Raja and Seatran ferries, and have their own buses to take you to and from. The ferry price is mostly B250, but this will depend upon the ferry time as some cost more. 4) Transport drivers. A tuk tuk driver slurred "two hundred" into "twenty" really well. And then took the writer to a travel agent,where double the correct price to Krabi was charged. The bus conductor gave a knowing smile and did not even ask to see the tickets. It appears that bus Drivers and Conductors are in on some of the scams, as above and also as in -2) above (or why does the bus stop where it does? This city is a little difficult to work out. There are three bus stations, and an airport and train station both roughly 15Km distant. You usually come along the road into the city from the train and distant (new) bus station. The road crosses a river,and then becomes Taladmai Rd. To work out where you are inside the City - with Bus Station No 1 on your right (and No 2 directly across the other side of the road)- directly ahead on Taladmai Rd is the way out to the train and distant bus station -also the roads north,south and west,some 5Km distant. Some 300 metres along the road (towards the out of town bus station) is the intersection with Chonkasem Rd (ถนนชนเกษม) To the left, the buses from Krabi come, and to the right is the Tapee Hotel, some 100 metres along. Another 100 metres along Chonkasem is Namuang Rd (ถนนหน้าเมือง)and on the corner is the Suratthani Hotel, also known as the Central Business District Hotel. It appears to be upmarket. To the right in this road (Namuang - is parallel with Taladmai Rd)) appears to be the main shopping strip. The street eats are in a Soi off this road, to the left if you are walking in this direction. (see below) Further along Chonkasem rd you will come to the river, in about another 300 metres. To the right there appears to be night time action on weekends. This is located in Soi 8 (in) and 10 (out)in Taladmai Rd. It is named "Downtown Transportation Hub Talad Kaset 1" (there is a large blue sign at the entrance) From here go the local songteows, plenty of tuktuks, and the orange non aircon bus to the station for B15. Many of these buses have "train station" in English on the front, but all go there. On the way there,they turn right out of Soi 10 and continue several Km to the main out of town four way intersection (highway 401) Then they turn right into the road to Chumphon, and stop at the Big C,(for local shoppers), then go a little further before turning left, and meandering a little, before coming to the out of town bus station (on the left) It will then go a couple of hundred metres, before turning right into the main west road (from the abovementioned four way intersection), and will continue to Phun Pin. On return, it will turn into the bus station road, do a U turn at the bus station for any passengers, before going back out to the main road. It will then turn left towards Chumphon,and stop at the Big C, before continuing and doing a U turn at the Homepro,then turning left into the main road into town and terminating at the terminal. These buses stop running at 6.30pm, and the terminal becomes deserted. After this time, you are at the mercy of the random tuktuks. A reasonable price to the train station would be 300 baht (Dec 2014). In addition from here goes an aircon bus to Nakhon Si Thammarat. It goes roughly every hour, is blue in colour, and is located behind the orange train station buses. Cost is B100, and pay on the bus. Also in this bus station are the songteows which travel to various destinations around the city, as well as tuktuks which can be hired (discuss the price first). This is located in Soi 31 of Taladmai Rd, almost directly opposite bus station number one. It is named "Downtown Transportation Hub Talad Kaset 2"
In this Soi are some Travel Agents (see scammers above). As you walk into the Soi from Taladmai Rd, on the right is the Bus to Krabi, and behind it goes a minibus to the same place. Buy your tickets from the bus agent, which is four doors down the Soi, with prices advertised. Bus is B150, minibus B170. they go regularly through the day. If the agent is not open, buy your ticket on the bus only and not anywhere else. About halfway along the Soi, also on the right are minibuses to Trang and Phuket. At the end of the Soi,on the right are minibuses to Chumphon for B170. In these places, you will see the prices advertised on the wall, and Thai people sitting inside and waiting for their minibus. Buy your tickets here only! The bus and minibus from Krabi arrive (as at 2015) at the entrance of Soi 10 on Taladmai Road. In the centre of the Soi, which connects with Soi 33 on the left as you walk from Taladmai Road, are many minibus and bus stops. Look for the sign and buy your ticket only from here and not a travel agent. You will usually see Thai people waiting for buses/minibuses here. The buses here go to Phang Nga, Phuket - timetable first class is 6.40, 8.40, 18.00,and second class is 7.30, 10.00, 14.00, 16.00 (is on the Soi 33 side of the centre); and Hat Yai. This is located some 5km out of town close to the four way intersection of the main highways north, south, west, and east into the city. To get from here into town,there may be tuk tuks, but there are plenty of non aircon orange buses which stop here. Cost is about B15. The one you want comes from the left on the opposite side of the road and does a U turn at the bus station. It will take you into the city. The one which comes from the right takes you to the train station. See in "Bus station number one" above the actual route these buses take to and from the terminal. The city center with everything you need (city pillar shrine, night pier, post office, temples, all the markets and good street eats) is within walking distance - if you're a bit fond of walking. If you would like a motorbike to ride around town or explore the sights nearby, you can rent from X Motorbike Rentals. Managed by a Thai-Canadian couple, they are extremely friendly and helpful. They are always more than happy to help out any way they can and to offer suggestions and advice for things to do, places to go, or food to eat in the area. The motorbikes are automatic and new and since X himself is a skilled mechanic, they are in excellent condition. If for some reason you run into any trouble, X will be out to help you immediately. He sells motorbikes as well to the local expat community. Car hire services are available at the airport. Western breakfast is rather difficult to find in the city centre. Jok is a rice porridge that's popular for breakfast. It's usually served with dim sum. There are a variety of locations around Surat, including Donnok Soi 1/1, Amphur Rd. next to Karunrat Rd., adjacent to the Taekwondo gym and pharmacy, among others. There is a Central Plaza on 401 on the way to Phunpin and the train station. You can find many regular Thai, western, and otherwise foreign chain restaurants there, along with a Tops supermarket that stocks some foreign groceries. There is a McDonald's, Starbucks, KFC, a variety of shabu-shabu and sushi restaurants, along with a Sizzler to be opening soon. Most travellers in Surat Thani are on their way to or from the islands: If travelling from Surat to anywhere, please read the travel agent scam report above. Correct prices to and from the islands as charged by Pha Ngan Tour, (Raja ferries from Donsak Pier to Koh Samui some 40Km south of Surat - bus transfer is included). (but note that the ferry stops in a place well away from the main road, and you will need to hire transport from the terminal) To Koh Samui 250 baht, to Koh Phangnan 320 baht, to Koh Tao 870 baht (except on the 11.30am ferry, which is 1100 baht, as it includes a speedboat). Ferry times (departing on the bus from Surat), are 05.30, 08.30, 11.30, 14.30, 16.30. Phantip Tour prices to Nathon Pier are mostly B250, and takes three hours from Surat. A bus leaves from outside the agency every hour from 0830 to 1730. To get to the out of town bus terminal, train station and airport, please also read above. Ko Samui — backpacker paradise gone up-market. Krabi - Both buses and minibuses go from Soi 31. The minibus from the agent about 100 metres along the Soi, on the right, and the bus from the centre of the Soi. The minibus cost is B180 and takes three hours. This page was last edited on 12 May 2018, at 04:57.